An action-packed show about the high pressures circumstances of paramedics, firefighters and the police. Basically all services you might call via 911. They save people's life during frightening situations, but their own personal lives are not that much easier most of the time. Where can you stream 9-1-1? On 2018-01-03 Drama/Action & Adventure TV Series 9-1-1 first aired on FOX. 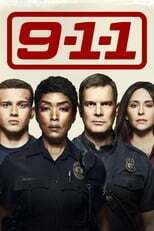 Written and created by Ryan Murphy & Brad Falchuk, and produced by 20th Century Fox Television, 9-1-1 will return and was last broadcasted on 2019-04-22.